A short time ago, a group of General Motors employees who are good at going fast formed the GM Performance Driving Team. The GM Performance Driving Team currently competes in the SCCA’s CAM-C autocross class, which is essentially open to any vehicle that’s road legal, built after 1989 and has a minimum weight of 3,250 lbs. With such limited regulations, you might think the GM team is running one of its V8 monsters like a Chevrolet Camaro ZL1 or Corvette Z06 – but for 2018, the team opted for something a bit more humble. As Grassroots Motorsports Magazine reports, the team was waiting some “secret” new parts for a Camaro SS build when they realized their V8 Camaro wouldn’t be ready for the 2018 season in time. They decided the four-cylinder Camaro 1LE Turbo, with its tuneable 2.0-liter and light front end, would be an interesting replacement and showed up to a local event at Michigan International Speedway with a stock car on stock wheels and tires. 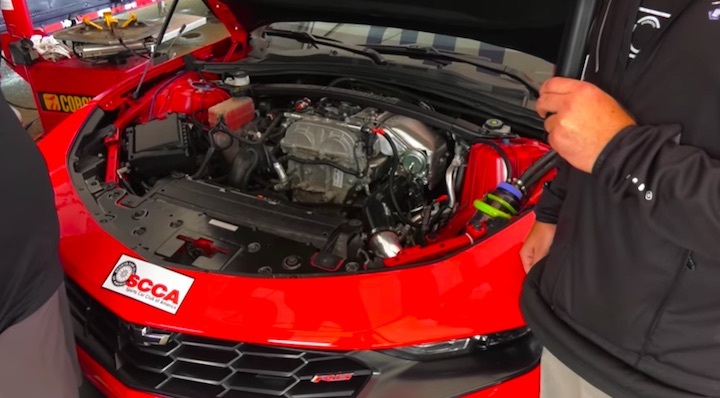 After establishing a base line, the GM Performance Driving Team installed the Multimatic DSSV dampers, rear sway bar, wheels and tires from the Camaro ZL1 1LE and turned up to the next SCCA event in Oscoda, Michigan. They realized the 2.0-liter’s throttle response was holding them back, though, so they turned up the boost and installed an anti-lag system. It worked – the Camaro was faster, but it also began chewing through turbochargers. It wasn’t always on the track either, as team driver Shaun Bailey explained to GRM. “It turns out that running anti-lag on the highway for 500 miles is a good way to cook your turbo,” he said. The team continued to tune the car and began posting up back-to-back CAM-C class wins before taking the CAM-C national title. By the end of the season, the Turbo 1LE was complete with a custom exhaust and oil catch pan and was also running a 55 percent alcohol/fuel mix. For more information and photos on this wild Turbo 1LE SCCA build, we suggest you read the full story over at Grassroots Motorsports Magazine. Photos by Grassroots Motorsports Magazine on YouTube. Those ‘little’ turbo engines can develop nearly 500 streetable hp. To run a turbo engine in competition you need an oil accumulator and a cool down turbo oil pump. Knowledge gained running an SVO back in the day.